Now that I am on the East Coast, getting together with other Davidow family members is very easy. 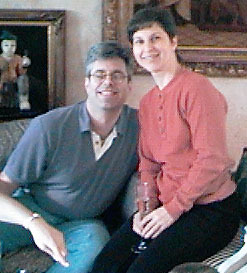 For the holidays, of course, that means getting together with my father's sister's family: Janet and Bob Bacon. It's a quick drive over on the Mass Pike to Rte. 84, down to Rte. 91, then a hop and a skip over to the Merrit Parkway (15), which runs into the Cross-Westchester (287)--very crowded on a Friday afternoon that is also Easter weekend--down the Garden State Parkway to Rte. 80, get lost a bit at the Wayne exits, and finally, even with the traffic jams only four hours later, there I was! This camera only holds 8 pictures, and my laptop is undergoing surgery for a cracked screen, so that was the limit for the night. 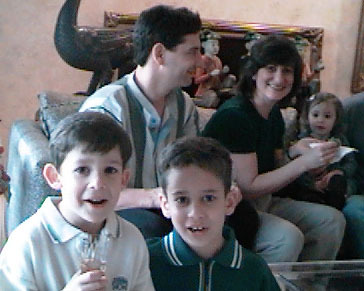 In deference to both holiday and the limits of the camera, we posed a few pix, and took a few at the table. The stars of the evening were obviously my cousin Shosh and her fiancée Steve. Since he's the new person in the family, I should be introducing him, but other than noting that he is a congenial and handsome addition to this generation's outlaws, he'll have to do it himself--at the wedding, if no earlier. That will be at the end of June, 1998. Having said that, it was also a pleasure to spend some time with the newest addition to cousin Craig Bacon and wife Linda's family: Dana, who is now about a year old. If you look at the family portrait, you can also appreciate Jeremy (kneeling to be closer to Alex' height) and Alex in the foreground. Jeremy is now in second grade! 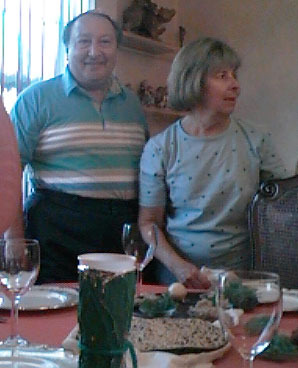 If all goes well, here is one of the worst pictures ever taken of my Aunt Janet and Uncle Bob. Nonetheless, they were the evening's hosts, and a picture must be here. The best thing about any seder, of course, is starting it. 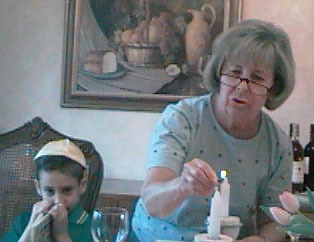 Here, Aunt Janet lights the candles while Jeremy looks on. It was Jeremy's good fortune (or lack thereof) to be sitting directly opposite me, whereas his younger brother Alex, was right next to me, carefully balancing the kiddush cup he made in school. 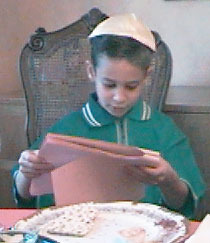 In a tribute to both of them, here is Jeremy reading the Hagadah that Alex put together in his Hebrew School class. At that point, I ran out of photo slots in the camera, so you have to imagine the rest. The family has a large collection of Reform Hagaddahs, quite seriously battered at this point. Bob likes to zip through the service focusing on the parts he likes best and making sure that we sing all the good songs. Linda was quite adept at pulling the kids into the seder. Alex did four questions in English, Jeremy did the Hebrew. (Or am I imagining who did what? At any rate, the kids did the four questions.) Shosh and I interrupted with occasional political tidbits. (Why should this year be any different from other years?) I'd say that we were encouraged not to, but really, by now, who noticed? We'll have to do better next year. The food included traditional chicken and kugel and vegetables, plus some delicious stuffed vegies for Shosh and Steve. We ended with marathon performances of "Echad mi yodea" and "Chad Gadya" and "Adir hu" and all the rest. A good time seems to have been had by all. 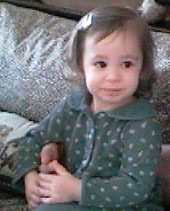 Now, when will the rest of you Davidow family folks get busy sharing the photos, eh? Rahbie Davidow scrapbook | Notes and photos from a trip down memory lane with my father (z"l), September 1995.